Willy Beamish is a nine-year old mischievous kid who lives with his parents and two sisters in the city of Frumpton. He likes to play the Nintari and hopes to participate and win the Nintari championship this summer. However, due to a poor school report, he fears his dad won't pay the entrance ticket for it. His fear soon becomes reality because not only does dad take away his Nintari key, he also lost his job! Now there is only one way to still participate, and that is by having his pet frog Horny winning the annual Frog Jump contest, organized by Frumpton's largest company, Tootsweet. Willy however discovers that Tootsweet owner Leona Humpford and plumber union boss Louis Stoole have an evil plan to acquire entire West Frumpton at the expense of Frumpton's people, polluting the entire city water supply. With his dad being hired as Tootsweet's new PR manager, the summer holiday becomes a race against time to save Horny, his dad, and the entire city! Willy Beamish is the third game designed with the Dynamix Game Development System (DGDS), following Rise of the Dragon and Heart of China. The game was somewhat controversial as it depicts mature themes in a game featuring a nine-year old boy, such as a frog named Horny, a nurse with large breasts, and suggestive conversation lines. First released for DOS and the Amiga, it was also remade on CD-ROM with voice actors. The "talkie" CD versions of the game, besides adding voice actors, extend the game's introduction and replaced the still character portraits with animated versions. The voice actor who plays Willy Beamish is Michael Zibelman. Additionally, while the floppy PC version offered the option of MT-32 sound and music, the CD version eliminates that option, leaving only Soundblaster and Pro Audio Spectrum as sound options. 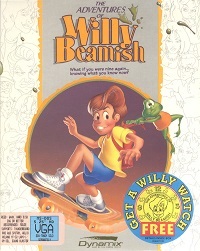 Certain retail boxes of the game included a mail-in form for a free Willy Beamish-themed wristwatch. The game was also released in 1993 for the Sega CD. One particular difference with the Sega CD-version is that it also contains an arcade game on the Nintari system which is actually playable whereas in the PC and Amiga versions it only displays a cut scene. Sierra's Summer and Fall 1991 InterAction magazines announced in the Rumor Mill section that a sequel for the game, titled "The Further Adventures of Willy Beamish", was in development before the original was even released. However, no sequel of the game was ever released.